Being a white belt is not easy. Especially in BJJ, a martial arts that, for many, is still too obscure and unfamiliar. In the last 10 months, I am still the newest newbie in my BJJ gym. I have seen new people came and participated in classes after me but then they stopped after a couple of weeks or months for whatever reasons. When it comes to rolling (sparring) session, I am still pretty much smashed by the higher belts until now. But this is okay because I know it is a process that I have to endure to be better and more proficient in BJJ. As a white belt, I know that it is still the time for me to learn how to defend and survive rather than attack and submit. Occasionally, I like to record my rolls on videos so I can analyze what I did wrong and how I could survive during rollings. Recording your rolls also allows you to see your progress and this could be encouraging. Getting smashed all the time might affect your confidence to keep going but if you can see by yourself that you are actually improving regardless of the smashings you receive, you might find it easier to continue your journey in BJJ. Now, here are some of the rolls I recorded and uploaded to my Youtube channel and I am going to leave some commentary of how I did. This is probably after around 3 months of training. I spent most of my time playing bottom half guard trying to sweep Dika, one of the assistant coaches in my gym, using the lock down. What I see from this roll is that I kept on losing the battle for the underhook and my whip up with the lock down was not properly executed. The underhooks, especially the one on the far side, is very crucial for lockdown attacks and I missed on these details because I was rushing a lot. Eventually, Dika deceptively allowed me to go for a deep half guard so that he could trap my arm in an armbar. A month later, I recorded a no gi rolling session with Kanda, one of my regular training partners. I always found the no gi easier because in this style of jiu jitsu, there are less attacks and manipulation using the lapel, collar or sleeve. 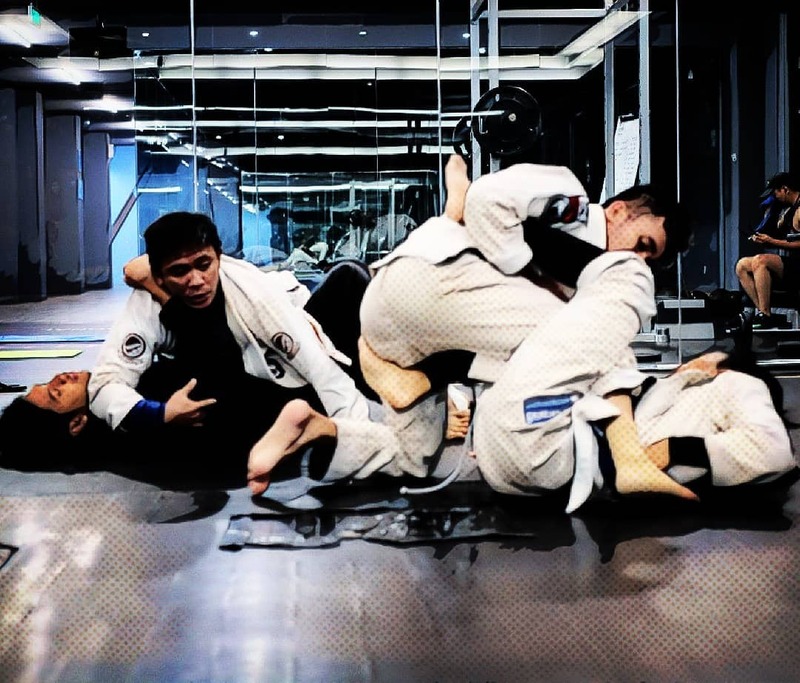 In a way, no gi jiu jitsu is less-jiu jitsu-esque because you need to rely more on power rather than leverage but it is also more newbie-friendly. In this roll, I got trapped in an ankle lock first but eventually managed to have my first ever submission via a guillotine seconds before time expired. A month later, I had the privilege to roll with my black belt instructor Professor Deddy Wigraha. When a black belt asks you for a roll, even if you are still a white belt, you should embrace the opportunity. Rolling with a black belt is a rare chance to learn directly from a master in a real life situation. In this roll, I spent at least 99% of the time defending submissions and attacks. This video also shows how different and effortless it is for a black belt to get into positions and combine submission flows if the opponent manages to escape. Check out the sweet armbar submission from the professor seconds I managed to escape the bow and arrow choke. Here I rolled against big Dika, one of the heavyweights in my gym. He is a gentle teddy bear and is very safe when it comes to roll with guys far lighter than him. I knew he could have easily smashed and broke me but he allowed me to drill some submission flows here. Although I could not get the finish, rolling with big guys like him train me to adapt and be more comfortable whenever I face a heavy pressure from the top. In this roll just a couple of weeks ago, my lockdown half guard has improved from the one you see in the first video. I could at least scored some sweeps and was more aware on winning the underhook battle first before attempting any move. The whip up still needs a lot of improvement. I also made a mistake of attempting a fireman carry takedown with an awkward angle which eventually put me in an armlock in the end. Matthew is a BJJ champion for the white belt division and he recently received his blue belt. At only 17, he has a lot of energy and athleticism. He smashed me regularly during my first months of training but those days really helped me a lot. Here, we rolled in no gi and it was a lot of fun. I recorded this video a week ago and I am quiet pleased to see how much my guard has improved from the first video. I still need to work on my balance when I am on top because I am still vulnerable to sweeps. My side control pressure also needs some work. The roll with Matthew was the latest rolling video recorded and uploaded. I am going to upload more in the future and hope you enjoy them.